I have quite a few unfinished drafts hanging around in my posting queue...whoops! Things have been very very busy for me lately. I've been working a lot of overtime, ended a relationship, taken up long-distance running, gotten a cat, bought Professor Layton vs. Phoenix Wright. I'm pretty tired most days, so when I come home, I just want to sit at my kotatsu and space out while reading blogs. Except that a lot of the blogs I used to read daily have tapered off in post frequency or, like one of my favourites has, stopped posting entirely. While being frustrated that my daily reading content seems to be vanishing, I failed to consider that perhaps somebody out there actually likes reading my blog and was disappointed to see my posts dwindling. Well! With that in mind, I decided today was the day for a quick post, though I suppose the topic is rather same old, same old. Last year I took a beating when I walked into the room, sat down, wrote the first section of the test, and then turned around to say to an acquaintance behind me, "Did we come to the N2 room by mistake??" It was a disaster. This year, I tried to crack the books way back in July, with the intent to study relentlessly until October 31, and then leisurely review during November on days when I didn't have the energy for novel writing. 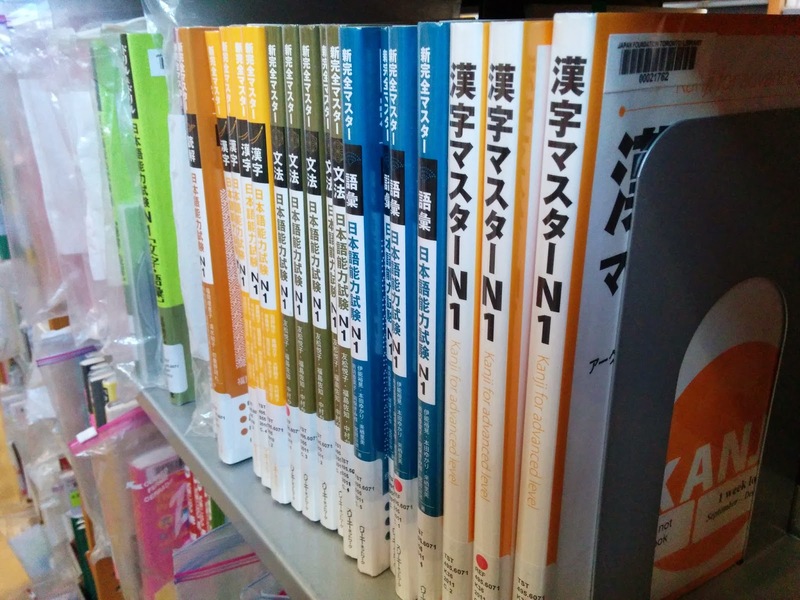 (I don't think it's a coincidence that I have passed the JLPT and won the National Novel Writing Month challenge, but never in the same year.) Suffice to say that it's October 22 now and I'm still on Week 4 of the So-matome grammar book, with two weeks of grammar and six weeks of reading comprehension to go. I did read Chi's Sweet Home, volume 11, on the subway yesterday. That counts as study, right? What I have been doing is kanji study, thanks to being frequently trapped on buses and trains with nothing to read and no cellphone games installed on my phone. (I was able to safely end my addiction to Hot Springs Story after beating the game for the third time.) 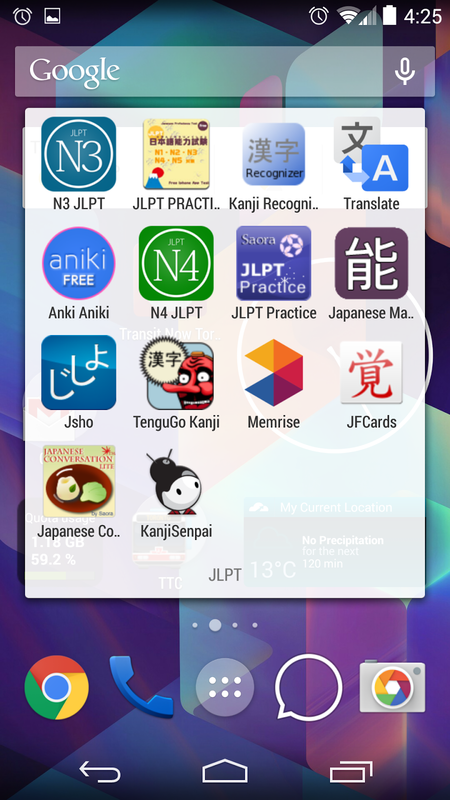 Though there are a few apps that I've tried out before to help get daily study in, I think I've finally found "the" app for Android, and it's called KanjiSenpai. I had to turn off the drawing component pretty quickly, but otherwise I'm finding it to be really good. It uses the usual spaced repetition system (SRS) but it seems to be much better at coming back later and making sure I really know the answers to ones I guessed. Plus, it rotates between offering the meanings and the readings of compounds, as well as making you choose between several cards that are very similar, which is great for me. You can also remove cards that you're 100% certain you know - I took out number kanji, for example, and the cardinal directions, days of the week, and other kanji I use in everyday life - but the app is still going to check in with you 500 cards later and make sure you know them. If you've been looking for a good study app that will teach you the kanji rather just quizzing you on what you already learned from a textbook, this is it. Another good one I had been using before finding KanjiSenpai was TenguGo, which cost me a dollar-something and had an interface I liked well enough. The quizzes came in small, easily-devourable packets (harder to put off studying when you can say "Meh, I'll just do one quiz,") and the tengu threw me a little on-screen party when I finished a certain number. 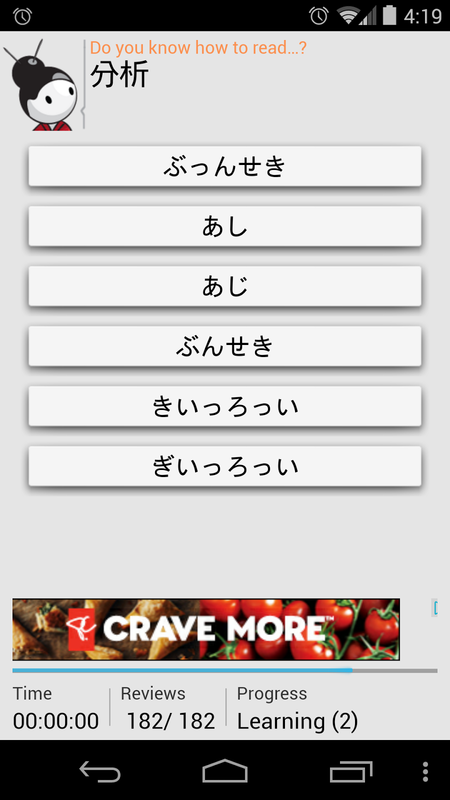 However, it assumed you already knew all the kanji in the quiz. You can opt to "review" items (see the screenshot) but it packs just a bit too much info into its screen, and by the time I got to item #10 I had already forgotten #1. The SRS method is much better for me. 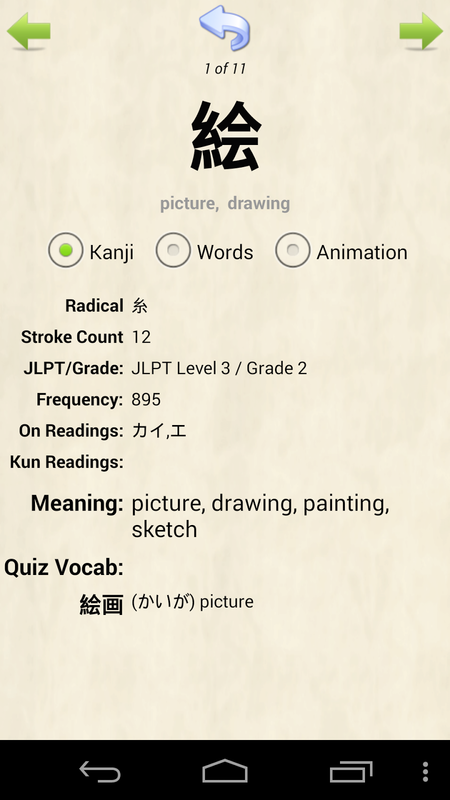 One other app I had been using before I switched to studying grammar via textbook is one called "N3 JLPT PREPARE" (yes, very descriptive) by V-Next software that does kanji, vocab and grammar quizzes. You can choose a quiz with 30 words, 50 words, 70 words, 90 words, 100 words or - not for the faint of heart - 200 words. The search function also seems good at a glance, though I never actually remember to use it. (Google Translate is always too close at hand.) My intent was to come back and use this app to quiz myself once I'd learned enough items to actually pass a quiz. Maybe it's time for a quiz right now!? I'm not getting any younger - and December 7 just gets closer and closer! Anyone want to share their own recommendations for JLPT study apps?